Nicola Giannini is a Sound Artist and an Electroacoustic Music Composer. 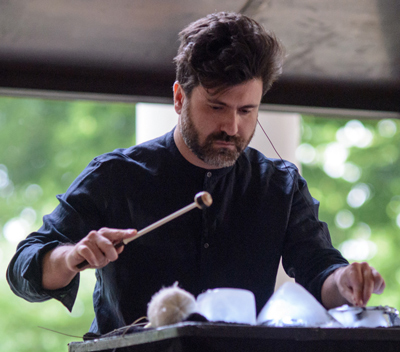 His practice focuses on acousmatic and live immersive music. He is interested in sounds that evoke physical materials and living organisms. In July 2017 he has been a guest composer at the EMS in Stockholm. He played at the Toronto International Electroacoustic Symposium, at the SoundsLikeThis in Leeds, at the TEDxLondon, at the Serge Postgraduate Conference in Aberdeen, at the Palazzo Strozzi Museum in Florence, and at Sound Spaces Festival in Malmö. His acousmatic music was played at the New York City Electroacoustic Music Festival, at the Sound-Image Colloquium at the University of Greenwich, at Electroacoustic Music International Exhibition in Mexico, and at Sound Thought Festival in Glasgow, at the Audior Concert in Milan, Italy. His acousmatic piece “For Hannah” was chosen as finalist at the International composition competition Città di Udine 2018 and it was performed at the festival “Contemporanea”. Nicola has a master degree in Electroacoustic Composition from the Conservatory of Florence, with honourable mention. From September 2018 Nicola is a doctoral student (D.Mus) at the Université de Montréal, under the supervision of the Professor and Composer Robert Normandeau. He also joined the Groupe de Recherche en Immersion Spatiale (GRIS) as research assistant. Guest Composer at Elektronmusikstudion EMS in Stockholm – 2017 July 24th to August 3rd. Thanks to the contribution of the Italian Culture Institute in Stockholm. Tempo Reale, research and production music center, Florence, Italy 2016 May to September. 2016 May – Musicaelettronica.it – Call for DIY sound sources: My piece Inner Out (Intimacy) has been selected for the call for works “self-built Sound sources” by musicaelettronica.it a blog created and managed by Tempo Reale. Cathedrals – Pietro Riparbelli – 2016 May: My recordings of the Santa Maria del Fiore church in Florence (Duomo) have been featured in the Cathedrals Project by the philosopher, composer, and sound-multimedia artist Pietro Riparbelli.